Eiroshell™ is a patent protected product range of highly monodisperse, durable and reproducible porous core-shell silica particles manufactured by Glantreo. Our proprietary process is completely tuneable allowing control over physical properties of the particles including the core and shell dimensions. 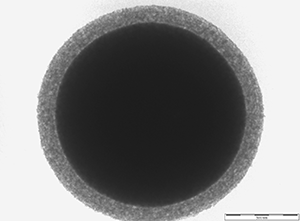 The technology uses a sol gel templating approach to grow a porous silica layer on the solid silica core. Eiroshell™ allows researchers to improve results and increase productivity without large capital expenditures. By delivering significant improvements in speed and separation efficiency over traditional 3- and 5-micron columns, Eiroshell™ allows scientists to get performance comparable to sub-2-micron columns without investing in UHPLC systems. With Eiroshell™, researchers can achieve UHPLC results on any LC instrument.